The Tsuetate-onsen Hot Springs, located on the border of Kumamoto and Oita prefectures in the middle of Kyushu, was called “the inner parlor of Kyushu” in early to mid-Showa period. In those days, the area achieved a plush and chic lifestyle, introducing new games faster than surrounding areas, such as shooting, Pachinko, and pinball. The Tsuetate-onsen area is a part of Oguni, in the Aso region of Kumamoto prefecture. 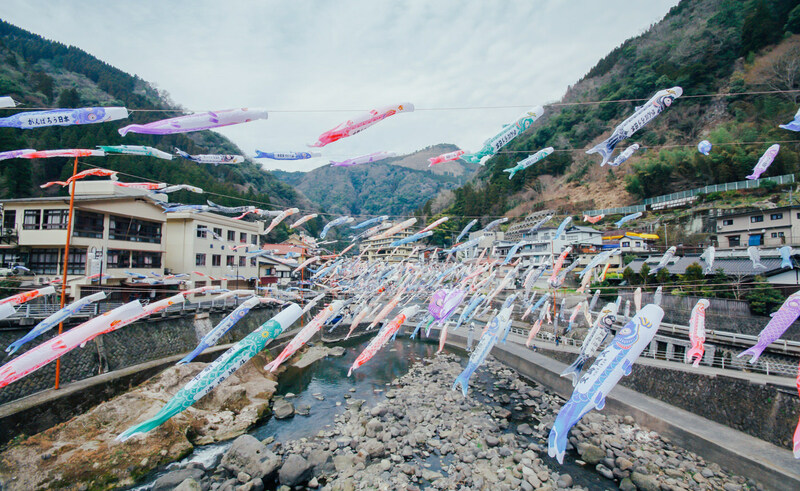 Because of its distinctive culture, some tourists mistake the Tsuetate area as its own separate town. This unique culture may confuse some tourists as the Tsuetate area gives the impression of being a “small independent country.” Nowadays, the Tsuetate area is moving ahead on a reasonable town development plan, making use of the lessons of its past prosperous period. 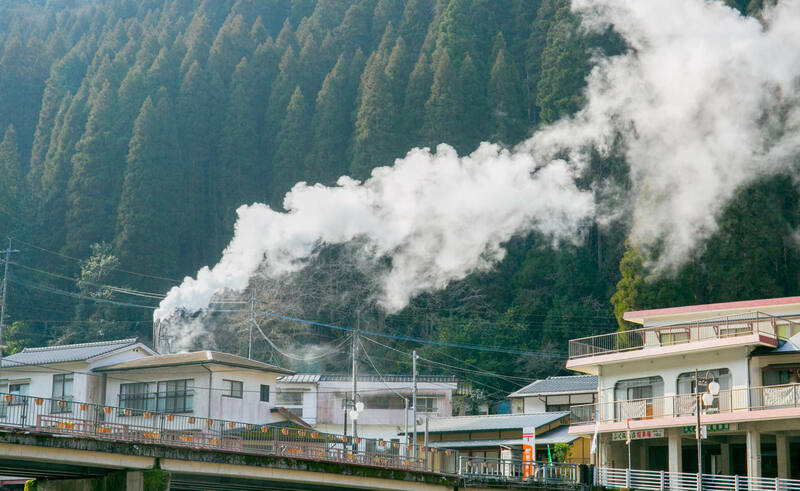 Tsuetate-onsen gives the utmost priority to not only preserving the limited high quality hot springs, but also offering customers a tranquil and leisurely experience. 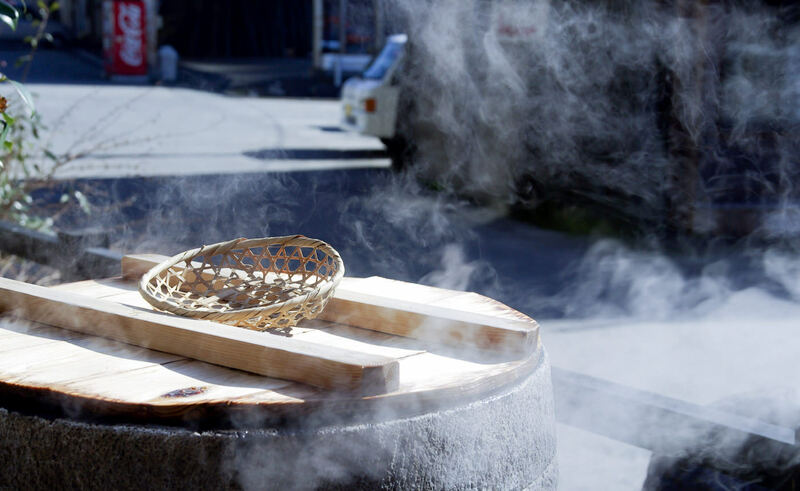 Keeping these priorities in mind, Tsuetate-onsen is promoting the town development project in cooperation with 22 Japanese-inns and stores in the area. Recently, more customers are fascinated by the back ally atmosphere maintained since the Showa period. Many tourists stroll through the rustic and unique atmosphere, capturing an environment that has undergone constant remodeling and expansion over the years. In the Tsuetate area, the back ally is called “Sedoya” (the house behind the other house). Many culturati visit this area and take a fancy to the nostalgic and quiet ambience. The history of Tsuetate-onsen dates back to the 1800s. When Empress Shinko went on an expedition to Korea, she was pregnant with the child of Emperor Chuai who had just recently died. As soon as she retreated to Munakata in the Chikuzen region after the war, she went into labor. A gray old man then appeared and said to her, “Follow the river in a southeastern direction, and you will see a magical spring. Draw water from the spring, use it for your baby’s first bath, and it will extend the life of the Prince until he is 1000 years of age.” Then he disappeared. Hearing this message, her squire went over jagged mountains and found the steam coming off the spring in a big rocky cavern. He drew water from the spring, brought it to the Empress and dedicated it as her baby’s first bath. The Prince was born. It is believed that the Prince later became known as Emperor Ojin. Moreover, Tsuetate-onsen is believed to be the place where this magical spring was. The place-name “Tsuetate” also has a mysterious legend. In the beginning of Heian period, the Buddhist Monk Kukai, also known as Kobo Daishi, visited the Tsuetate area in the course of his pilgrimage and was tremendously impressed with the benefits of hot springs. He put his stick in the ground, then magically branches and leaves grew out of the stick’s knots. This story is the origin of the name Tsuetate (Tsue means a stick, tate means remain). Addition to this story, another origin is that the sick or elderly people visited the area with their sticks (tsue) for the hot spring cure, but they left (tate) their sticks after they took a bath. © tsuetate onsen All Rights Reserved.